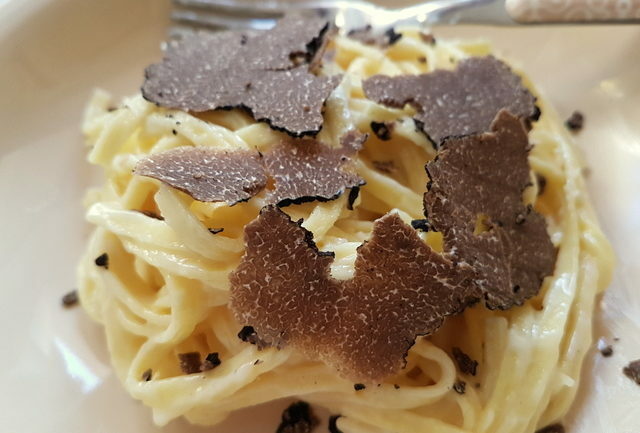 With just one mouthful of this Northern Italian recipe for tagliolini with taleggio and black truffle, you will fully understand why truffles are the most prized of foraged foods and have been called the diamonds of the kitchen! Tagliolini al tartufo con taleggio. The other day my hubby came home with a bag of black truffles! Yes a whole bag! 20 truffles! In many parts of the world you’d pay a fortune for that! In fact, black truffles are often referred to as ‘black gold’! But, we are lucky enough to live in a part of Italy where these truffles are quite plentiful, especially in the autumn. My hubby is a family doctor in a mountain village and his patients often bring him presents of foraged foods or homemade yummies! Last week it was black truffles; the week before, honey mushrooms with which I made a wonderful pasta with white ragu and wild mushrooms! There are two kinds of truffles found in Italy; white and black. Black truffles are harvested in autumn and winter. So it’s truffle season now! These truffles can be found in a number of parts of Italy. Because they are more common than white truffles, they cost less, but are still highly valued in the kitchen. White truffles are rarer. They are found mostly in Piemonte/Piedmont. The most famous white truffles come from the countryside around the cities of Alba and Asti. 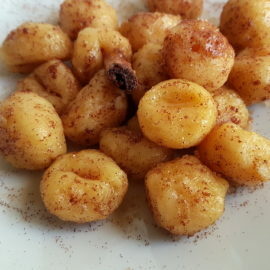 However, they are also found in la Marche near Urbino, in Molise and Abruzzo and in Tuscany. So, what is a truffle? In short, truffles are a fungus that grows near tree roots. In fact, this subterranean mushroom is found among the roots of chestnut, oak, hazel, and beech trees. The word truffle comes from the Latin ‘tuber’, meaning outgrowth. Truffles date back to as early as the Sumerians and ancient Egyptians, who loved them and ate them coated in goose fat! In the Middle Ages, truffles became unpopular. This is because, the church believed that because of the exotic aroma, truffles were the creation of the devil. They were even known as the ‘witch’s fare’. And, for centuries, very few people ate them. During the Renaissance, truffles became popular again. Louis XIV of France was fascinated by truffles and even tried, unsuccessfully, to cultivate them! In the 1700s the white truffle from Piemonte was considered by all the European courts to be a choice delicacy. Truffle hunting became court entertainment. Guests and foreign ambassadors to Turin were invited to take part. Between the end of the 17th and the beginning of the 18th century, the Italian kings Vittorio Amedeo II and Carlo Emanuele III were serious truffle hunters. Today truffles are considered among the most sought after delicacies. Although there is some truffle farming in France, Italy and other countries, it is an expensive undertaking. It takes up to 30 years for a truffle orchard to reach full production because truffles have to be farmed with their host tree! Most Italian pasta recipes for black or white truffles are pretty simple. Truffles are rarely cooked in the sauce. Instead, truffle shavings are added to the finished dish and the truffle is eaten raw. Because truffles have a strong umami flavour they are usually paired with only a few other ingredients. Among the few other strong flavoured competing ingredients you may find in a truffle dish is porcini mushrooms. But since both are foraged fungus, they actually go together really well. Double the deliciousness! 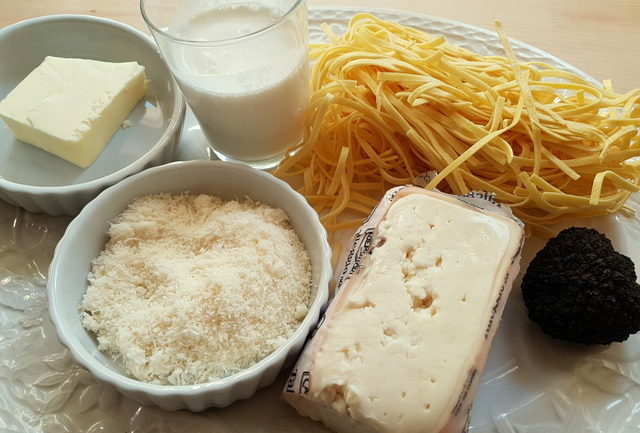 Different types of cheese are often paired with truffles. In fact, you can buy cheese made with truffle in it here in Italy! So delicious! 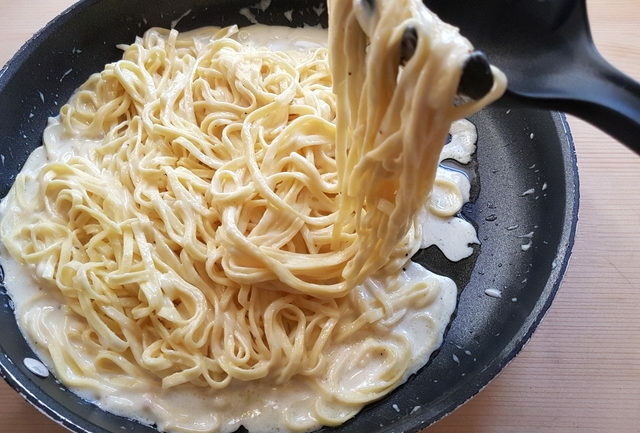 In this tagliolini with taleggio and truffle recipe, I have used taleggio, a typical Northern Italian semi-soft ripened cheese from the Val Taleggio in Lombardy. Although taleggio smells quite strong, it has a relatively mild taste. It is also is a great melting cheese. Taleggio has been produced in Italy since Roman times and production normally happens in autumn and winter. This cheese is aged on wooden shelves in special chambers, sometimes caves, and matures within six to ten weeks. It is washed once a week with a seawater sponge to prevent the growth of mold and to form an orange or rose crust. If you can’t find it, you can use Fontina, Robiola or even Brie. 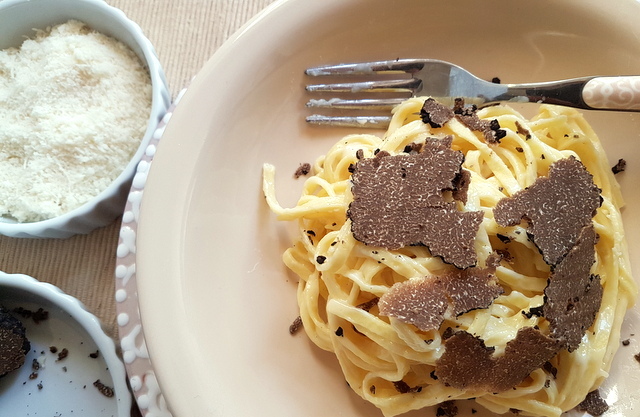 This recipe for tagliolini with taleggio and black truffle. This recipe is super simple and really easy and quick to make. The ingredients are few and you can have this dish on the table in the time it takes to boil the water and cook the pasta. I used fresh tagliolini which took 1 minute to cook. While the water was boiling, I made the cheese sauce. 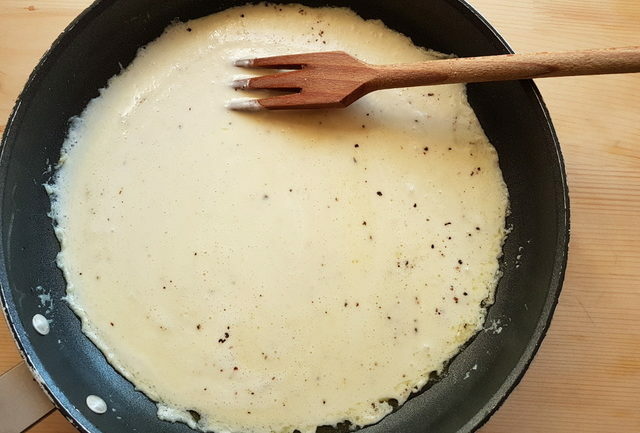 This involves just melting the taleggio with some butter and fresh cream, 5 minutes! Then all you need to do is mix the pasta with the cheese sauce, plate and add some truffle shavings. The ingredients may be few and the cooking process simple but, this is a dish that you will be dreaming about for days! This is 5 star food! 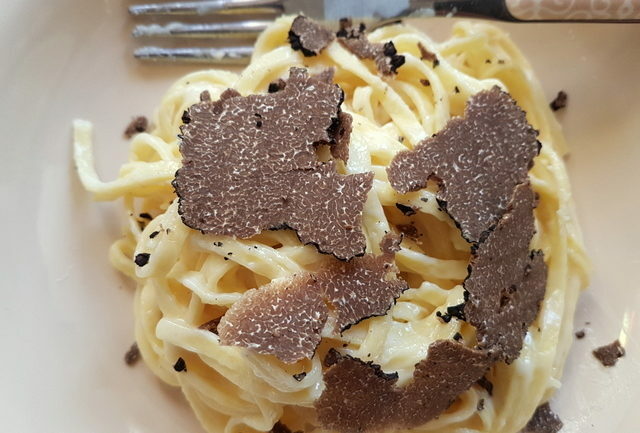 If you are able to source a black truffle or two, I recommend you try this tagliolini with taleggio and black truffle. You’ll think you died and went to foodie heaven! If you do make this tagliolini with taleggio and black truffle recipe, I’d love to hear how it turns out and if you liked it. So, please leave a comment here on the blog or on The Pasta Project Facebook page. 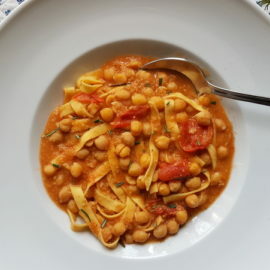 Other delicious authentic Italian pasta recipes for tagliolini pasta for you to enjoy! If you are able to source a black truffle or two, I recommend you try this luxurious tagliolini with taleggio and black truffle. You’ll think you died and went to foodie heaven and your guests will too! 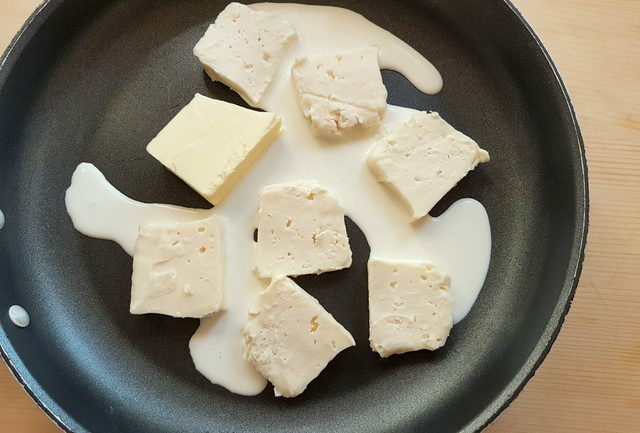 Cut the taleggio into small pieces and melt it in a pan with a knob of butter and the cream. Stir continuously. As soon as the sauce has become creamy, season with salt and pepper. Serve immediately with shavings of black truffle and a sprinkling of grated Parmesan. You can use tagliatelle instead of tagliolini for this recipe. To shave truffles it's best to have a tool called a truffle shaver/slicer. They are available online. Honey mushrooms? Hmmm I need to try those! You are so lucky to have so many interesting ingredients in your backyard and I love that you showcase them in your recipes. Thank you Alisa! Yes I love the fact that I get to cook with some interesting ingredients! Those honey mushrooms were soo good! Of course, you can use other ingredients too like other types of mushrooms, or porcini instead of truffles! All yummy as well! Jacqui this looks amazing! I love how simple this looks but with all that flavour packed in. It looks so comforting and decadent! Grazie dear Amanda! 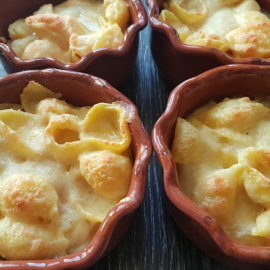 I’m so happy you like this recipe! I love using truffles with simple recipes so that their flavour reigns supreme! I am moving in to your house! What a delicious meal! Well done with the truffles! Haha, always room for one more at our table Kathryn! I think I died and went to foodie heaven just reading this post! I’ve never had truffles like this before, but now I’m on a mission to find some! This dish is wonderful. Thanks for sharing! I really hope you find some fresh truffles Krista! They really are heavenly, especially with pasta! Truffles and pasta are the best combo! Love this recipe and can’t wait to make it! 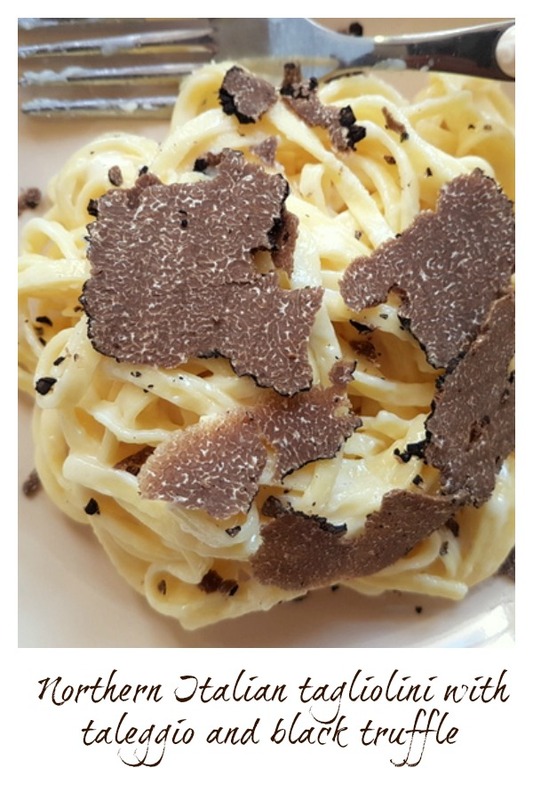 Yes, pasta with truffles is absolutely wonderful Lesli! I’m sure you’ll love this dish if you make it! I never knew that truffles are considered one of the most prized foods of foraged foods in Italy, and called the diamonds of the kitchen! I have never tasted them before, but they look absolutely divine. 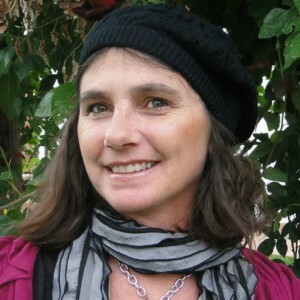 Truffles are really wonderful Jeanette and considered a delicacy by many! But, some people don’t like them. I hope you’ll try them one day and like them as much as we do! Drooling. Looks fantastic. I just can’t wait to try this for my family. YUMMY! Thanks so much Sri! I’m sure your family will love this dish! WOW that’s absolutely amazing that your husband came home with a bag of 20 truffles! I cannot even begin to think how much that would cost in Philadelphia! I had truffle pasta in Croatia and it was amazing so I’m sure this recipe is too! I know, Vicky, so amazing! I gave some away and put some in the freezer, but first I made a couple of to-die-for delicious pasta dishes like this one! I’ve had truffles in Croatia too. There’s an area in Istria which is famous for truffles! Taleggio is one of my favorites! This dish looks delicious! Thank you! Taleggio is a delicious cheese Ellen! We use it a lot in cooking as it melts so well but it’s yummy on bread or crackers too! This is a great comfort food recipe! Also love the information about truffles. Thanks for sharing! Thanks so much Annissa! Happy you like the info about truffles! Yes this is real comfort food at its luxurious best! That looks so delicious! I have always wanted to try truffles! In the US, that jar of truffles is worth hundreds, I think! I must come and visit you! Grazie dear Beth! In a way it’s a pity that truffles are so pricey, especially outside of Italy and other countries where they grow! Yes come and visit during truffle season and I’ll treat you to some! I LOVE, LOOOOVE Truffles, but never had them fresh!!! This looks so delicious! Thanks so much Tina! Fresh truffles really are superlicious! I hope you’ll get to try them one day! 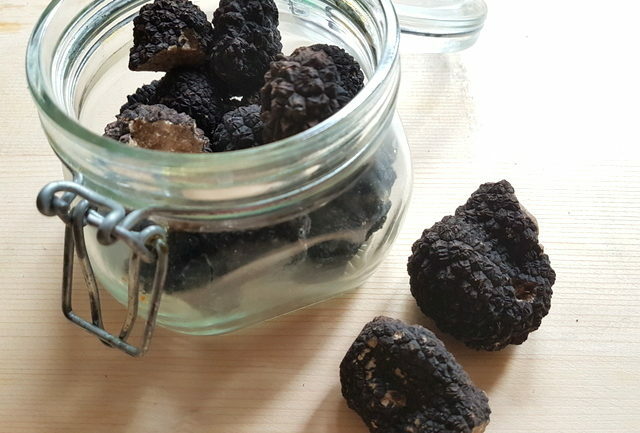 Come to Italy during truffle season! Wow! I’ve never cooked with black truffles, definitely time to give it a go! Adding fresh truffles to a dish really raises it to a whole new level of deliciousness Cliona! Here in Italy we don’t just eat them on pasta but also in risotto, on eggs (my favourite!) in soup and on meat. This sounds delicious and must be such a treat with those gorgeous black truffles in. I’ve never had truffles like this before so would love someone to make this for me! Thank you dear Corina! Come to Italy during truffle season and I’ll make this dish for you! I’ve never heard of truffles before but they seem like a fascinating ingredient! Many people say that truffles are a required taste Maria and not everyone likes them! But, here in Italy they are really sought after and loved! I hope you’ll get to try them one day! Thanks so much Sherri! Yes, this is heaven on a plate! I’m still dreaming about this dish! 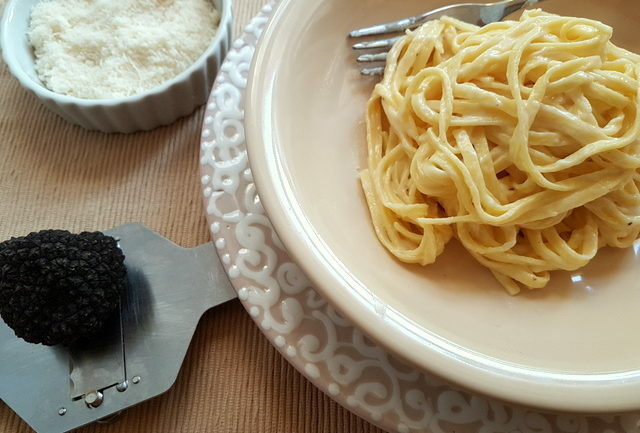 I love truffle pasta – it takes me back to my trips to italy. YUM! Truffle pasta really is one of the most delicious Italian dishes Danielle! Nice that you got to try it here in Italy! How luscious and creamy! Such comfort food. Thank you Caroline. This recipe really is comfort food at it’s finest!